Keywords: Maggot therapy; necrotic abscess; surgical debridement. 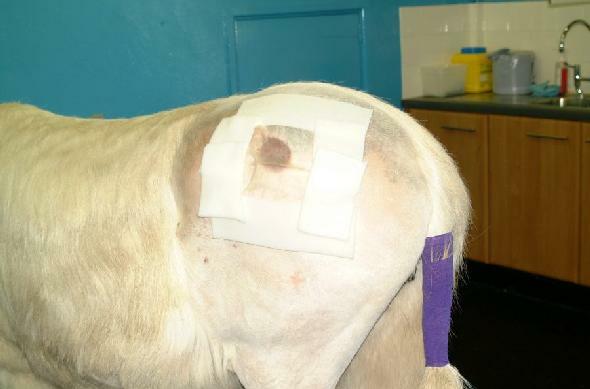 An ageing female donkey developed a deep necrotic abscess in the left gluteal region as a sequelae to an intramuscular injection. 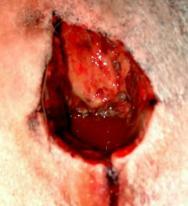 Surgical debridement was complicated by deep tracts into the muscle tissue with poor visibility and access. Sterile larvae of the common greenbottle, Lucilia sericata, were used on three occasions to debride the remaining necrotic tissue after surgery. The wound healed well with no adverse consequences. A female donkey aged approximately 25 years old, was relinquished to The Donkey Sanctuary, with a history of deteriorating ability to rise unaided and stiffness in the hind limbs. There was a history of a previous unspecified intramuscular injection in the left gluteal region. The donkey had asymmetry of the hindquarters with marked swelling over the left gluteal region. She had a history of chronic laminitis and limited response to analgesia with non-steroidal anti-inflammatory drugs. She was excessively hairy and tested positive for equine Cushing's disease (pituitary hyperadrenocorticism) using a standard 24-hour dexamethasone suppression test (Figure 1). Shortly after admission the swelling on the left gluteal region ruptured through the skin revealing a deep necrotic abscess cavity. The donkey was sedated and the abscess opened up using a cruciate (cross-shaped) incision, followed by flushing with large volumes of water. The abscess was 15cm in diameter and extended deep into the underlying muscle. 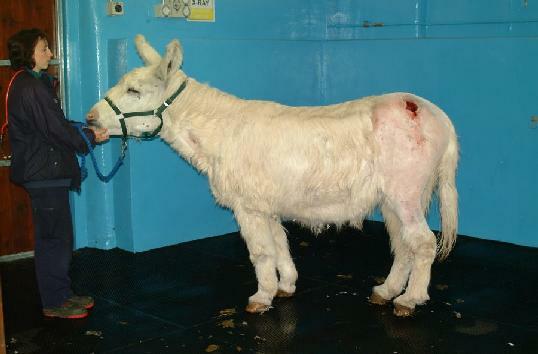 Five days after the abscess ruptured, the donkey was anaesthetised and the abscess debrided. At surgery as much diseased tissue as possible was removed, but several deep tracts remained dissecting through the muscle. 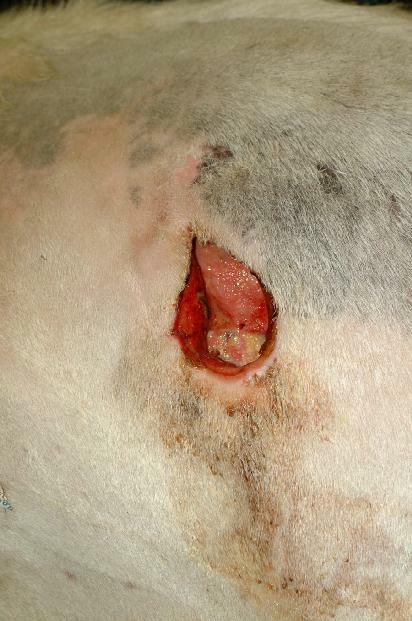 Due to the poor visibility, and possibility of damage to the sciatic and caudal gluteal nerves, it was decided to use sterile maggots to complete debridement of the areas with limited access. After surgery the wound was flushed daily and a hydrogel (Intrasite gel) applied. However, areas of necrotic tissue remained difficult to remove and pus continued to suppurate from the deep tracts (Figure 2). Eight days post surgery 150 sterile larvae (LarvE) were put into the wound (Figure 3), any remaining hydrogel having first been rinsed out with sterile saline. The wound was dressed with a saline soaked gauze and this was held in place using PolsterPlast (Snogg animal bandages). A few maggots were able to leave through this gauze, but it appeared that the majority were directed to the necrotic tissue (Figure 4). Figure 3 - Abscess eight days after surgery. Necrotic tissue visible ventrally. Figure 4 - Dressing to hold maggots in place. After three days the gauze was removed and the wound examined. 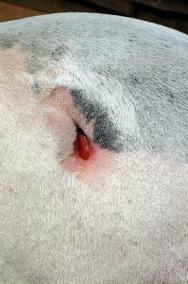 Most maggots had left the wound and the area of necrotic tissue had decreased significantly. 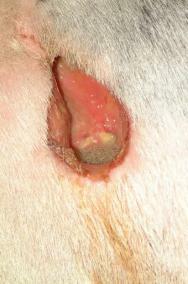 Healthy granulation tissue now covered approximately 80% of the wound surface, and the previously necrotic tracts were closing down. Any remaining maggots were flushed out of the wound using sterile saline (Figure 5). Figure 5 - Maggots after three days in the wound. Two further applications of sterile maggots were made at three-day intervals. Due to the decreased necrotic tissue available only 50 maggots were applied at subsequent dressing changes (Figure 6, Figure 7). After the third application of maggots the wound was covered in healthy granulation tissue and a few large maggots remained in the wound. The wound continued to contract, fill in and epithelialise until only a 2cm depression remained in the skin surface at the site of the wound (Figure 8, Figure 9). Figure 6 - Second application of maggots. Some necrotic tissue visible ventrally - dorsal part of wound has been debrided. Figure 7 - After second application of maggots, there is granulation tissue dorsally and some necrotic tissue ventrally. 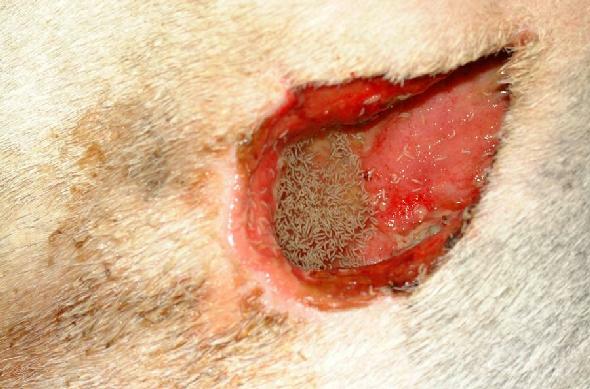 Figure 8 - After third application of maggots, there is mainly healthy granulation tissue visible in the wound . 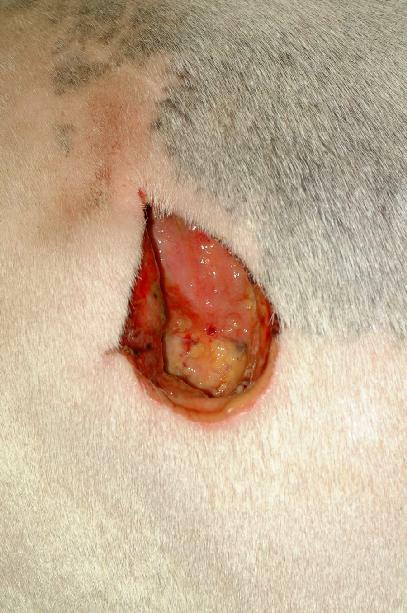 Figure 9 - Two weeks post maggot therapy. The wound is contracting well. Throughout the period of treatment the donkey's general mobility improved consistently and there was no further problems with attempting to rise. It is presumed that the pain of the deep muscle abscess had contributed to the hind limb stiffness and led to increased periods of recumbancy. Since resolution of the abscess the donkey has been able to move well. Sterile maggots have been used on a previous occasion in the Donkey Sanctuary  with equally good results. No adverse effects were noted as a result of either treatment. 1. Bell NJ. 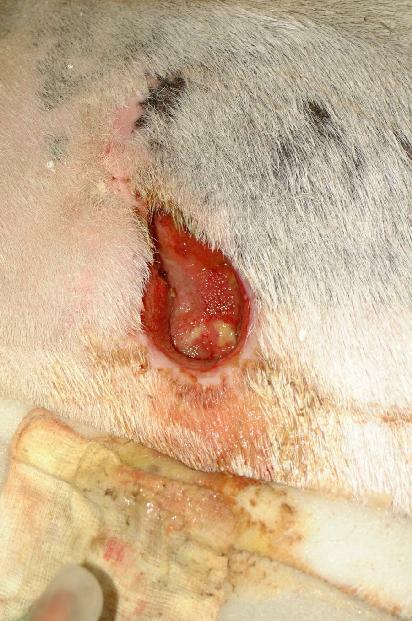 Use of sterile maggots to treat panniculitis in an aged donkey. Veterinary Record 2001; 149: 768-70.